Morgan Y. Evans is a singer and music/political columnist from the Kingston/Woodstock area. He loves small dogs and coffee as well as long hikes, epic hormonal shifts and balancing mindfulness and skeptical humanism with Tarot cards, mosh pits and fortuitous synchronicity. 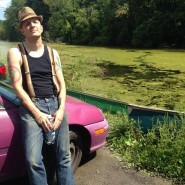 He has sung for bands upstate for 20 + years and writes "Kingston After Dark" for The Kingston Times. He is also a regular contributor to Amp/Hails & Horns magazines, Crusher Magazine, Noisemag.net (Paris), Newnoisemagazine.com, Dyingscene.com and Metalriot.com. He prefers Dio to Ozzy and grew up playing in the woods with muddy sticks and rocks. Photo by Songs of Light Photography.